When your own kitchen cabinet design is where you want the focus, the Inserta Plus built-in is the range hood to choose. Made from the high quality 430 stainless steel, the Inserta Plus features 3-speed electronic controls with convenient auto shut-off function, long lasting, high output LED lights that are an eco-friendly way to brighten your cooking surface and aluminum mesh filters with stainless steel decorative panel that will maintain their luster even after many washes keeping your range hood looking as beautiful as the day you bought it. The Inserta Plus combines quiet and powerful ventilation with a sleek design that blends perfectly with every kitchen design. It is ready to fit today's modern lifestyle. The Chambers classic pyramid shaped 600mm hoodfan continues the heritage of innovation and efficiency that the brand is known for. Manufactured by one of the most up-to-date ventilation facilities in the world, with a research and development passion to bring new materials, technology and concepts to the hood fan market. With a design office in Italy, Chambers premium stainless steel hoods are an affordable luxury that bring to your kitchen sophistication, style and performance. The 30-inch GE Profile range hood offers the technology home chefs expect to assist in preparing great meals for family and friends. The four-speed, 600 CFM fan promptly removes steam, smoke and odours from the air, while the dual halogen lighting with night-light option illuminates the cooking surface. 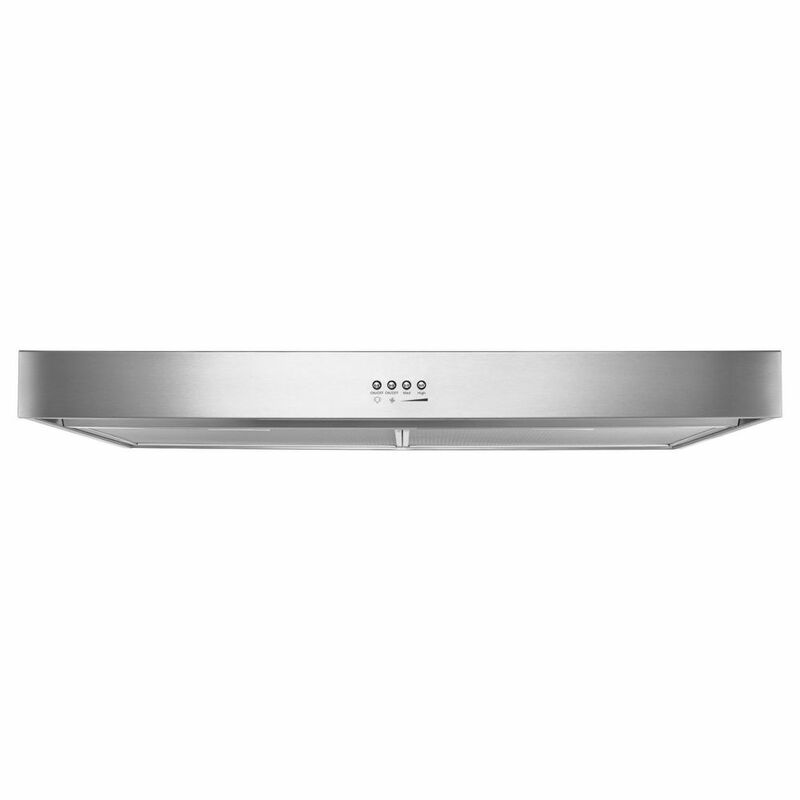 36-inch Range Hood with Full-Width Grease Filter in Stainless Steel is rated 3.6 out of 5 by 8. Rated 3 out of 5 by Mike from Unit is nice and is quite quiet, however it does not come with the necessary carbon filters! Home... Unit is nice and is quite quiet, however it does not come with the necessary carbon filters! Home Depot doesn't carry the filters. The only vendor online that I found doesn't stock them, so we have to wait nearly 2 weeks for what should be a provided-component of the hood. Rather disappointing. Oh, and the delivery people were a joke too- a one-day snow storm last month delayed my delivery an entire week!!! Rated 3 out of 5 by Trynity56 from The hood is simple. The buttons almost look cheaply made,... The hood is simple. The buttons almost look cheaply made, but it gets the job done. It's thicker towards the back and thins out towards the front, so be mindful of that when looking at the measurements. The 36 is the width of the back part, not the front. Rated 2 out of 5 by Dobeman from Installed and the lights work but the fan just hums. Have verified all wiring and installation an... Installed and the lights work but the fan just hums. Have verified all wiring and installation and no dice. Good luck finding any support on this either.